JUST ARRIVED AN OLD COLLECTION OF. 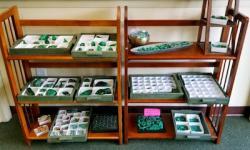 MALACHITE & CHRYSACOLLA SPECIMENS , ANIMAL CARVINGS , FREEFORM POLISHED CANDY DISHES , OBELISKS , PENDANTS , SMALL CARVINGS , AS WELL AS. 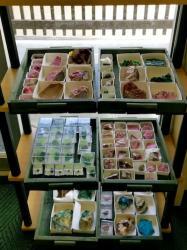 LARGE COLLECTOR QUALITY OBELSKS , CARVINGS , VASES , BOXES, GRADUATED BEAD NECKLACES AND EARRINGS ....... AND MORE.... 1ST COME FIRST SERVE. ALL AT 50% DISCOUNT FROM RETAIL. High Quality, great patterns and wonderful craftsmanship,this material is mined and found only in Zaire, the former Congo.Cut and polished banded malachite with lacy swirls and bulls-eyes in eggs, carved animals,jewelry boxes and pyramids. Metaphysical Properties: Stone of balance and transformation. Brings to understanding processes in one's life and body, assisting in one's spiritual evolution. Stimulates intuitive power, making one more open to change and advancement. 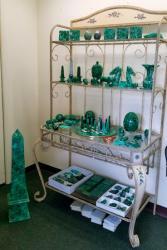 Malachite also represents fidelity, loyalty, practicality, and responsibility. Allows for insight into emotional factors that may be manifesting as physical illness. It is known for protection against radiation and for strengthening immune system. Eases delivery in birthing, and also facilitates the re-birthing process, as it helps one to recognize and clear past negative experiences. SPIRIT QUARTZ(CACTUS QUARTZ) SELECTIONS FROM SOUTH AFRICA. Thousands of tiny crystals covering the quartz point, sparkling all over. At the base of the point you can see the root crystal, which has an unusual look and feel. Spirit quartz aka Cactus Quartz is found only in Magaliesberg mountains in the Gauteng Province of South Africa and is unique in the colorful drusy covering. Can be used in meditation particularly to provide insights to family or community problems. This is an exceptional crystal to use with groups as it helps to stimulate group cohesiveness and a willingness to work together, also enhancing harmony and peace in the group. It is also an excellent stone to use with team healing. It has also been used to activate and cleanse other minerals, to enhance and increase the energy of other minerals, and to activate the properties of it. It is also a wonderful abundance manifesting stone. The energy of this crystal moves outward in many directions and the quartz structurehas the capacity to draw or to transmit energy through the many paths provided by the crystals covering the main structures. It is a very useful stone for both magnifying and stimulating energy in all portions of the physical, intellectual, emotional and spiritual bodies. Can be used to cleanse the chakras by clearing any negative energies and filling any voids with positive white light energy. Also try using this crystal for astral projection and lucid dream work. Place the crystal under your pillow at night to increase and intensify the dream state. It both opens and activates the crown chakra and the third eye chakra, and enhances intuition.